The contemporary female Blues Rock scene has never been more vibrant with an abundance of artistes like Joanne Shaw Taylor, Samantha Fish and Beth Hart giving the guys a run for their money. 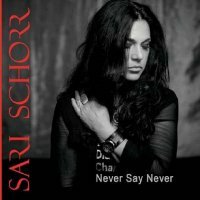 However, it's a genre I rarely pursue, preferring them to fall into my lap; therefore, with only Chantel McGregor and the lovely Mollie Marriott passing my way recently, I'm not exactly an aficionado, but this release from Sari Schorr has really piqued my interest. 'Never Say Never' is the second album from the New York native, following on from her 2016 debut effort 'A Force Of Nature', and it's quite easy to see why she has been compared to the likes of Tina Turner, Elkie Brooks and Janis Joplin. What impresses me is that the album was recorded completely live to capture the raw energy of the music, Schorr's emotional, husky delivery perfectly complemented by the quite amazing guitar licks of Ash Wilson (who shines throughout) along with the swirling Hammond Organ textures from Bob Fridzema and a superb rhythm section of Mat Beable (bass) and Roy Martin (drums). The album steers clear of the more melancholic, reflective side of the Blues with only 'Beautiful' living up to its name and the title track (a cover of a song written by Small Faces' keyboardist Ian McLagan after his wife's tragic death) tugging at the heartstrings. Instead, the likes of opener 'King Of Rock And Roll', 'Thank-You', the energetic (and totally brilliant) 'Valentina', 'The New Revolution' and 'Freedom' veer in a harder but highly melodic Blues Rock direction, the grittier sound emphasised by the raw yet rounded production, while the smoother, Country-tinged 'Turn The Radio On' and 'Back To LA' are sheer perfection and thoroughly appeal to my tastes. Another highlight sees Schorr wrapping her golden tonsils around a cover of Bad Company's 'Ready For Love' and she instils the same emotion and power into the song as Paul Rodgers did with the original. I certainly don't proclaim to be an expert on the genre, but I'm willing to wager you won't find a better female-fronted Blues Rock album this year.